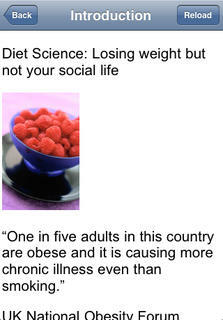 Diet Science ebook - Losing weight but not your social life. * Discover how to use Low Carb eating techniques as a way to lose weight - healthily and conveniently. * Understand the healthy difference between Low Carb and Low Fat: a direct comparison. 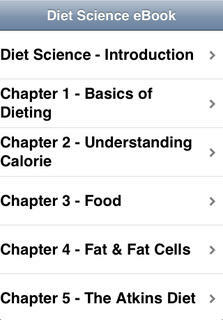 * Learn how to count calories easily with Low Fat. * Benefit from scientific average weight and calories charts. * Develop a greater understanding of your own body and the simple biology behind food digestion and metabolism. Ultimately your body is a science that responds to scientifically proven techniques. This book will help you understand how to apply these in ways that are both practical, simple and realistic! - No longer requires network connection to download content on first load. All content are now embedded and ready for immediate viewing. - Added feature to remember last read position inside each chapter. When you next open the same chapter, you will be starting from where you left off. * Coming soon. Next version will include BMI and other useful dieting calculators. Stay tuned.